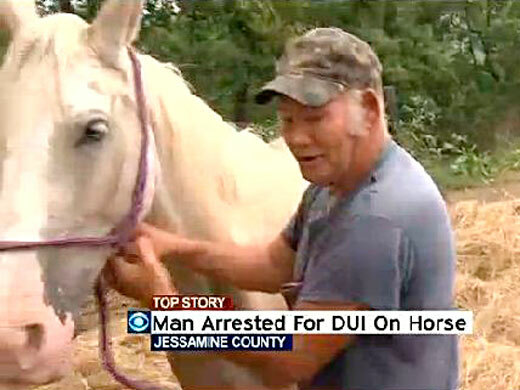 (Scroll down for video) Danny Reynolds 55, was shocked when an officer ordered him down from his horse and arrested him for the unusual crime of driving drunk on a horse. "I had no idea that I could be arrested for something like this," said Reynolds. Reynolds was riding with some friends near his home when he had to stop and take a break. “I stopped to get something to eat when the deputy arrived and told me to get off my horse," Reynolds said. He admitted to drinking a couple of beers. Reynold's blood alcohol level was two-times over the legal limit. "Upon a search of his pockets I located a package of rolling papers and a baggie of marijuana. Reynolds had several beers in his saddlebag and a mason jar which he identified as moonshine,” the arresting officer said. "I've have been in the department for 23 years and I have never seen a case like this," Chief Deputy Allen Peel said. Reynolds was charged with driving a non-motor vehicle under the influence, possession of marijuana and drug paraphernalia. Kentucky law KRS 189.520 prohibits the operation of a non-motorized vehicle while under the influence of alcohol or any other substance which may impair a person’s driving ability. That includes riding horses, bicycles, skateboards.